The gingerbread I grew up on came courtesy of our family friend, Betty Crocker. My mother, or sometimes my grandmother, would pull out a box of gingerbread mix, bake it, and serve it to the family in the living room. Nobody cared that it was from a box, and I have good memories of impromptu gingerbread made on happy, cold, evenings by someone who was in a good enough mood to go bake it. In my teens I tried to impress the family by making scratch gingerbread. It was darker and less sweet than the box mix, but that’s all I can remember. At some point I stopped making it and forgot which recipe to use. With the cold months, I’ve been thinking about reviving the gingerbread tradition and looking through scratch recipes that might be like the one I used to make. Yesterday I baked this one from The Dairy Hollow House Cookbook. It’s interesting in that it starts with a dry mixture and the fat (butter, but you can use shortening if you want) is cut in before adding the wet ingredients. The result is an ultra-moist cake that tastes even better on Day 2 when the flavors have settled. Fuzz seemed to like this and I thought it was good, but it wasn’t quite as molasses-y as I remember my old recipe to be. It is a favorite of many, however, and after I made it I found a few other bloggers who raved about it. If you like rich, sweet, gingerbread, this one’s worth a try. In the meantime, I’m still on the hunt for one that’s dark, spicy and less sweet. In bowl of a food processor, combine flour, sugar, ginger, cinnamon and nutmeg. Add butter and pulse until mixture is coarse. Reserve ¼ cup for topping. At this point you can dump the mixture into a bowl (which I’ve seen other people do) or just do it all in the processor, which is how I did it. Add egg and molasses and pulse to mix. In a cup, mix together the buttermilk, baking soda and salt. Add to processor and process until mixed. Batter will look a little lumpy with clumps of cold butter. Pour into pan, sprinkle topping over top, bake on center rack for 30 minutes. Let cool. Not all molasses is created equal so you may want to check that, but Emily Luchetti’s version from the Classic Stars Desserts cookbook is my go-to. Her recipe includes warm apples and cider sabayon but I use it with a lemon glaze or layered with caramel buttercream and decorated with candied ginger and milk chocolate. A fantastic recipe! I made two scratch versions of gingerbread this past holiday season. One was from the new cookbook called Flour (named for an excellent Boston Bakery), and the other one from the January/February 2011 issue of Cook’s Illustrated. The CI cake had Guiness in the recipe. The Flour version had a coffee glaze, which I loved, but, overall, I think I liked the CI version the best. Next time I make gingerbread, I will use the CI recipe and try the coffee glaze on it. Well, you said gingerbread and I thought of this one I’d remembered seeing Paige blog about. I want this for breakfast! David Lebowitz has my favorite recipe his site. Developed it when he was at Chez Panisse. Similar to Claudia Fleming Gramercy Tavern recipe. I use half melted butter and half oil, for flavor, though that’s only an option. Also, you can sub Guinness for the water. Either way, it’s super moist and nearly black. Divine. The only difference is my recipe calls for 1/2 cup molasses instead of a 1/3 and 1/3 cup butter instead of oil. Otherwise it is the same. It is less sweet since there is one cup total sugars to 2 cups flour so it might be what you are looking for. Plus since the sugars are brown and molasses, lots of flavor! I just found a 1/2 jar of molasses in the back of my refrigerator…has to be a few years old..tasted it…it is still delicious. I’ll find out tonight or tomorrow if it is lethal!! The gramercy tavern one is wonderful–dark and not too sweet at all. I know I used to make a ginger bread that was spicy and not too sweet so I’ll need search for the recipe…Just found it. It is Pumpkin Gingerbread quick breaqd though. From Better Homes and Gardens November, 1990!! The recipe is so old it is not on BHG’s website anywhere. OH well! I have not had that delicious aroma in my kitchen for a while..but looking at your bread I can imagine it! I’m going to love this series because gingerbread is my favorite! 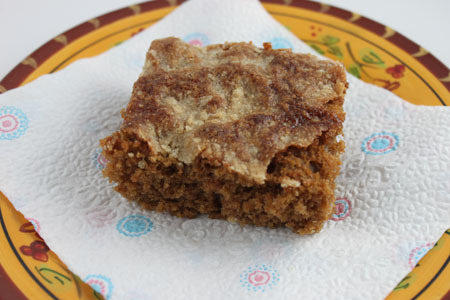 This is another Cooking Light recipe called Gingerbread Squares, it was good but the favorite is the old fashioned kind! 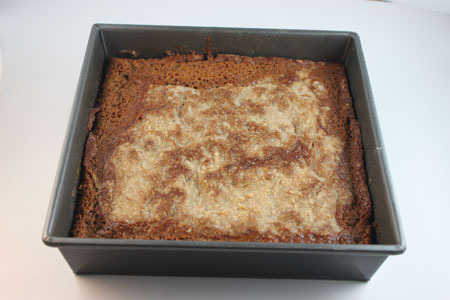 I know there is one in “The Perfect Recipe Baking Book” by Murray Jaffe (that I bought after you mentioned his brownie recipe).